On Saturday, Mass Oyster had an exciting time at the Boston Seafood Festival. We made new friends, met up with old friends and grew the base of supporters for oyster restoration. Boston Fisheries Foundation supports sustainable fishing, educating people about the importance of fisherman and our maritime traditions. In the new friend category, we met oystermen from Riptide Oysters in Westport, MA. The oysters are raised in an estuary of Buzzards Bay near Horseneck Beach. The guys shared with us the good news that there was a healthy natural set in the River. It was impressive hearing of their dedication and concern for the River. 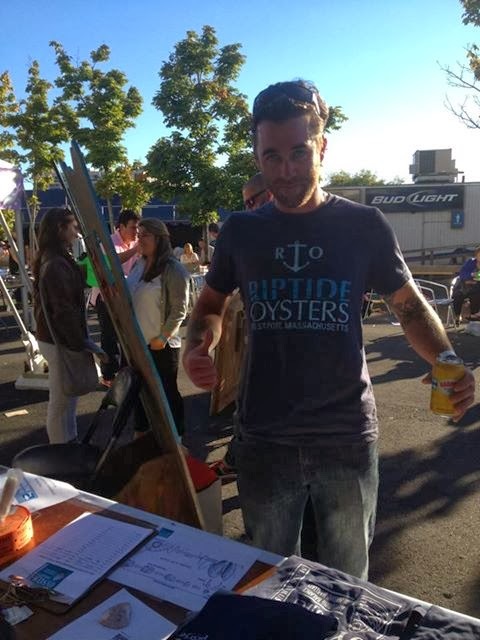 Oysterman from Riptide Oysters of Westport, MA. We shared with them some information gleaned from a very old Colliers Magazine, that the roads of the area were once paved with oyster shell. Additionally, there was a tourist business of taking people on carriage rides through trails cut through the 30 foot high shell middens left by the Indians. Moving to the North Shore, we connected with a gentleman whose Ipswich firm could be a source of shell. It appears that there is a natural set there as well. We also welcomed new volunteer Lindsey Schrier who did an awesome job at the booth. 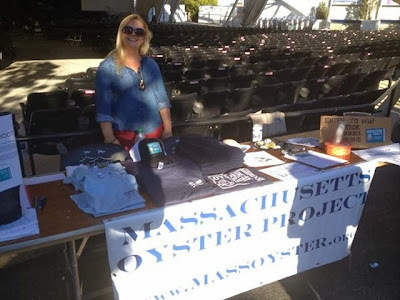 Lindsey Schrier selling Mass Oyster T-shirts and Caps. We also held a drawing. Two people won shucking lessons at the North End Fish Market on Salem Street in Boston's North End. Liz and Kerri offer shucking lesson son Saturday afternoons and generously donated this prize. At the lessons, they show you how to get the oysters open without opening your skin and blood vessels. Having the ability to shuck opens up your world to being able to buy oysters and serve them at home. It is a skill every New Englander should have like eating a lobster, ice skating or sailing a boat. The winner of our last Mass Oyster windbreaker was Christine Doucet. 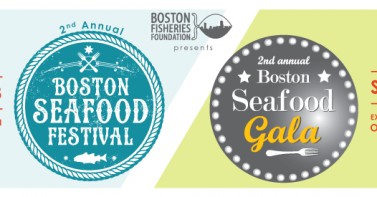 Come join us in a few weeks at the Wellfleet Oyster Festival on October 19 and 20.